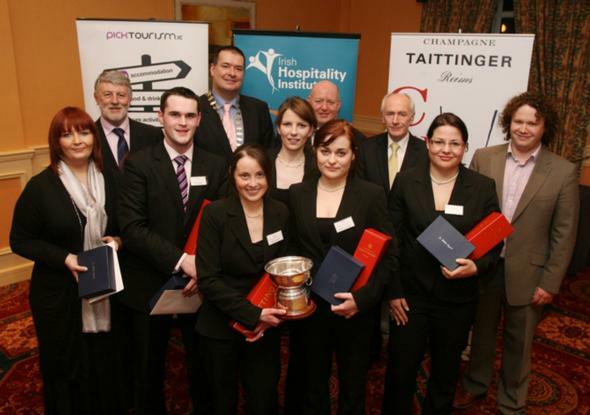 A Team from the CIT Department of Tourism & Hospitality were the outright winners of the 2009 IHI Business Management Game in Galway. The competition attracted 14 teams representing hospitality colleges from throughout the country. Game participants spend two days devising a strategy, planning and managing a fictitous hospitality business in a simulated business environment, reflecting current economic conditions. Each team had to deal with real life issues including interaction with competitors and the wider business environment, while at the same time managing a number of internal issues which were put to them. The real life simulation was achieved by way of using the HOTS business management simulation software. The adjudication panel for the event was made up of senior members of the Irish tourism and hospitality community and the CIT team was selected as outright winner after the two day event. CIT Team Captain Aoife Walsh spoke of the teams delight in winning the overall prize of a 2-day tutored trip for the team to Champagne Tattingers historic Chateau de la Marquetterie and Vineyards in Reims, North East France. The winning team, under the tutorage of Ms. Grainne Daly included Aoife Walsh, Rachel O'Leary, Marie Griffin, James Smiddy and Julia Stroebele. The Irish Hospitality Institute (IHI) is a professional voluntary non profit organisation founded in 1966 for managers in the hotel and tourism hospitality sector in Ireland. The main focus is the professional interests and needs of managers within the Irish tourism and hospitality industry.